Argo’s XTVs are renowned for their unparalleled off-road capability as well as their ability to cross lakes, streams, and other waterways without needing the infrastructure required for boats. However, their unique design also helps them excel in an area seemingly unrelated to backwoods travel: spraying. Whether you need to spread pesticides, insecticides, or liquid fertilizers, using an XTV can make the job fast and easy while reducing the impact on the landscape. When you use an XTV, aerating and grating can be less frequent because the ground isn’t being compacted. XTVs spread the load by using several massive tires designed to run at low pressures. Even when fully loaded, the ground pressure is less than that of a human foot. This means you can roll over land without compressing the soil or damaging the plants underneath. Instead of changing the angle of the front wheels with a steering rack, XTVs turn by using a braking system that slows the inner wheels. That means there’s far less scrubbing when you change direction, further protecting the soil. Liquids are heavy, which means weight capacity is often the determining factor when loading a spray system. 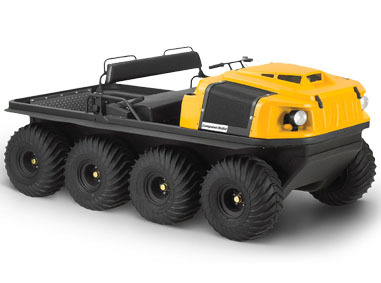 Depending on the model, an Argo can carry up to 1,500 lbs. (680 kg,) so that’s not going to be a problem. The engine, transmission and axles sit low in the hull, resulting in a low center of gravity. This reduces the chance of a roll-over by as much as 75% compared to an ATV or UTV. This weight distribution also keeps the vehicle stable if the spraying system is mounted inside the vehicle, eliminating the need for a separate trailer. When it comes to local conditions and terrain, the only limitations are created by the operating requirements of the spraying system and liquid. An XTV floats over soft surfaces like mud and sand, and even ice is no problem. Working in remote areas? The XTV can simply drive into and out of bodies of water, and the low center of gravity keeps it stable on steep terrain, letting you take a direct route for reduced transport time. Adding a sprayer doesn’t mean reducing cargo and personnel capability, either. You can still use your Argo to move your crew wherever you need them, carrying up to four people at a time. Racks and trailers can also be added to expand cargo capacity, letting you bring in everything you need for the work day in one trip. Worried about the environmental impact of your XTV? Since the sprayer tank, engine, and other mechanical parts are inboard of the hull, any leaks are contained in the vehicle. No matter how you look at it, using an Argo XTV can greatly reduce the time you spend transporting and spraying chemicals.